This was a Direct Wines bottle, with rather a minimalist label, claiming to be Bin Number M13, but I think they just decided there was no point in spending money on label design if the wine was just going to be shipped out in mixed cases selected by their team. It’s not a decision I’m against, as there are some terrible labels out there that put people off perfectly good wines because they look so cheap and tacky. A fake sample style bottle label is a step up from that and keeps costs down, even if it does deny an unpaid intern a week’s work and something disappointing to put in their portfolio. 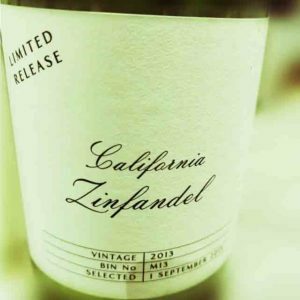 So on to the Limited Release Californian Zinfandel ’13, it’s a warm dark red colour, but not very deep. It has thick legs when you swirl it. It smells of fresh sweet berries with just a hint of vanilla. That sweet fruit carries through with raspberries and blackberries front and centre. There’s a little pepperiness there too, but mostly it’s fresh squishy fruit. The flavour lasts well and there’s plenty of mouth feel, with alcohol on the high side. There’s not much in the way of tannins, they’re soft and ripe. It’s not sweet, but with a big alcohol hit and plenty of fruit it tastes a little on the sweet side. This came as part of a mystery mixed case, one of those you get each quarter, a sort of “editor’s choice” of wines. I rather enjoy that surprise opening, although you’re never guaranteed a favourite, Laithwaites (Direct Wines) assure me that if I hate anything they’ll replace it I don’t think I’ve ever really hated anything (since I told them never to send pinotage), but I’ve had a few dullards. This wasn’t one of them. I thought this was a great value Californian Zinfandel at £8, I’d happily have paid more, and I’ll look out for it as an option in other cases.